The history of Ridge Vineyards begins in 1885, when Osea Perrone, a doctor who became a prominent member of San Francisco's Italian community, bought 180 acres near the top of Monte Bello Ridge. He terraced the slopes and planted vineyards; using native limestone, he constructed the Monte Bello Winery, producing the first vintage under that name in 1892. This unique cellar, built into the mountainside on three levels, is Ridge's production facility. At 2600?, it is surrounded by the "upper vineyard." In the 1940s, William Short, a theologian, bought the abandoned winery and vineyard just below the Perrone property; he replanted several parcels to cabernet sauvignon in the late 1940s. From these vines -- now the "middle vineyard"-- new owners Dave Bennion, Hew Crane, Charlie Rosen, and Howard Ziedler, all Stanford Research Institute engineers, made a quarter-barrel of "estate" cabernet. That Monte Bello Cabernet was among California's finest wines of the era. Its quality and distinctive character, and the wines produced from these same vines in 1960 and '61, convinced the partners to re-bond the winery in time for the 1962 vintage. Dave Bennion left his role at S.R.I. to oversee winemaking duties full time. The first zinfandel was made in 1964, from a small nineteenth-century vineyard farther down the ridge. This was followed in 1966 by the first Geyserville zinfandel. 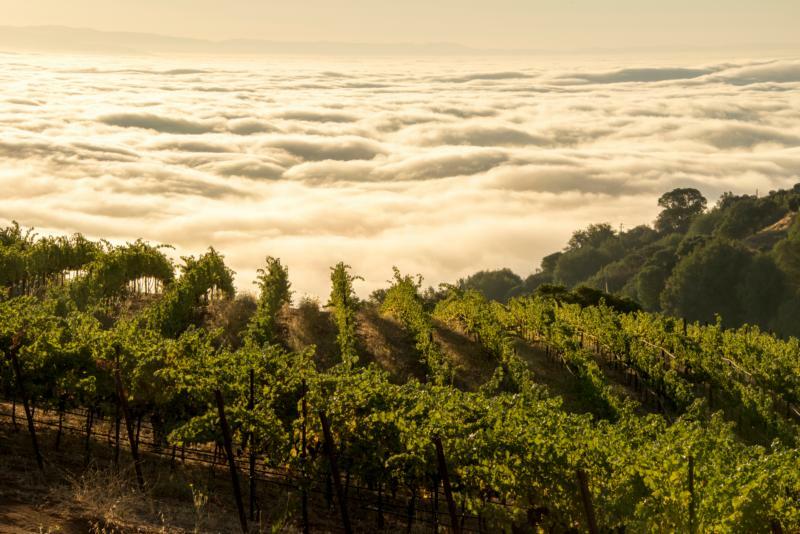 The founding families reclaimed the Monte Bello terraces, increasing vineyard size from fifteen to forty-five acres. Working on weekends, they made wines of regional character and unprecedented intensity. By 1968, production had increased to just under three thousand cases per year, and in 1969, Paul Draper joined the partnership. A Stanford graduate in philosophy--recently returned from setting up a winery in Chile's coast range--he was a practical winemaker, not an enologist. His knowledge of fine wines and traditional methods complemented the straightforward "hands off" approach pioneered at Ridge. Under his guidance the old Perrone winery (acquired the previous year) was restored, the finest vineyard lands leased or purchased, the consistent quality and international reputation of the wines established. Cabernet and Zinfandel account for most of the production; Syrah, Grenache, Carignane, and Petite Sirah constitute a small percentage. Known primarily for its red wines, Ridge has also made limited amounts of chardonnay since 1962. Lytton Springs, in Sonoma County, became part of the Ridge estate in 1991. A quarter century's experience with this vineyard had convinced us that it was an exceptional piece of ground. Forty consecutive vintages of Geyserville attest to yet another stunning combination of location and varietals. Though born in the early sixties to the post-Prohibition world of modern California winemaking, Ridge relies on nature and tradition rather than technology. Our pre-industrial approach is straightforward: find intense, flavorful grapes; intrude upon the process only when necessary; draw the fruit's distinctive character and richness into the wine. Vinous 95 "The 2014 Petite Sirah Lytton Estate is outstanding. Deep, luscious and intense, but with none of the aggressiveness Petite so often presents, the 2014 is utterly captivating from the very first taste. Dark red and blue-hued stone fruits, mint, spices and licorice are front and center.